MANHATTAN — After sending some 70,000 people onto the Hudson River in kayaks from West 72nd Street during the past 10 years, the Downtown Boathouse saw its dock destroyed this past winter. The culprit: the improved water quality made it very hospitable for woodworms that gnawed away at the dock. Hurricane Sandy then gave it a "good kick in the pants" along with another storm that followed, said Graeme Birchall, president of the volunteer-run organization that operates the world's largest free kayaking program. But the kayaks will be back this season. A new dock — made of plastic — was expected to arrive by Memorial Day weekend, thanks to $35,000 in city funding, Birchall said. As parks and new buildings have popped up along the water's edge in recent years, there's been much talk about "waterfront access," but Birchall likes to talk about "water access" — ways to get your toes in the water. "We think that the billions of dollars the city spent cleaning the harbor shouldn't be foreign aid for fish. It should be for residents," said Birchall, whose organization also has kayak programs at Pier 96, off West 56th Street and Pier 40, off Houston Street. "It's getting better value for money by having a more livable city." Other options for water-loving New Yorkers abound at the West 79th Street Boat Basin, where a café looks out at the marina. There's a sailing camp for adventurous kids and chartered yachts that are favorites for wedding proposals. For those looking for total immersion, there's the Hudson River swim that's part of the city's triathlon. "The Hudson has a great mystique to it. It's got this allure," said John Korff, organizer of the Aquaphor NYC Triathlon. "Where else on a cloudless day can I look way over my shoulder and see the Statue of Liberty and look over my toes and see the George Washington Bridge?" "You're not supposed to drink this stuff. You're supposed to swim through it," Korff said. But on a hot summer day with an ozone alert, a kayak is the best place to be, according to Birchall. "You're sitting 2 feet above the Hudson and it's acting as a filter," he said. "We guarantee you'll get wet," he continued. "We do actually want you to go back to work on Monday and tell you're co-workers you touched the Hudson and didn't turn green." Here is a range of Upper West Side water activity options for everyone. 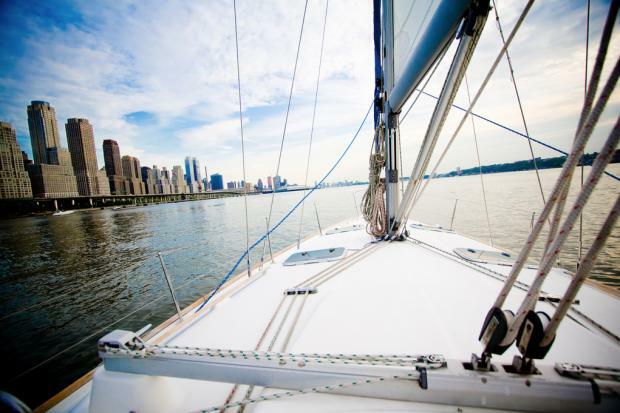 Atlantic Yachting's NYC Summer Sailing Camp for kids ages 9 to 15 has become a hot ticket during the past seven years, with waitlists for many of the two-week sessions (which cost $1,990) that run from June through August. The camp is based at the 79th Street Boat Basin. "It's grown into one of the premier sailing camps for kids in the city," said general manager Logan Rowell "It's a very exclusive kids camp: we only take 12 kids [per session]. We have a demand that far exceeds that, but we want to keep it small and intimate." The camp has evolved in some ways to meet the demands of Upper West Side families, for instance, by adding awards and certificates documenting skills and levels that the kids reach. "Especially on the Upper West Side and all over Manhattan, there's such a battle with resumes for high school and college and even middle school, so [families] want to have it on paper," Rowell said. He also added after-school programs last fall and is going to try to have a session in the first week of October during the Jewish holidays, after parents in the area asked for it. Atlantic Yachting also has sailing lessons for adults from May through the end of September or October, weather-permitting (cost: $375 per person for weekend group lessons). "It's one of the greatest ways to get out on the water," Rowell said. "People learn a new skill and they get to spend the weekend out on the Hudson." The Downtown Boathouse offers free introductory ocean kayak classes on Wednesday nights at Pier 96 — which includes an on-water component since it covers the skills needed if you fall out of your boat, Birchall said. When the Downtown Boathouse began running out of West 72nd Street in 2003, more than 3,800 people signed wavers to go out in kayaks. Last year, 6,765 did. At Pier 96, which started running in 2005 — and saw 735 people sign waivers —there were more than 12,000 people sign up last year. Further south at Pier 40, more than 17,400 went out in kayaks last year. "More than 1 percent of the residents of Manhattan went kayaking for free last year," Birchall said. The youngest participant was 6 months old (with a parent). The oldest was 94 years old. While people come from all over the city to kayak with the group, paddlers at 72nd Street tend to be locals. For instance, 5 percent of the residents in the 10069 zip code — which includes the Trump Place buildings along Riverside Boulevard — went kayaking last summer, Birchall said. The Downtown Boathouse will offer its free kayaking at 72nd Street on Sundays initially and expand its offerings if it can get more volunteers. At Pier 96, there will be kayaking on Saturdays, Sundays and weekdays. Adults are required to know how to swim to go out. Kids are not required to be swimmers, but they must be accompanied by an adult and have a legal guardian present. Roughly 3,000 people will jump into the Hudson for the triathlon on July 14. Now in its 13th year, the race includes the biggest organized swim in the Hudson. The swim portion starts at about West 100th Street and continues to West 80th Street. "It's with the current because if you go against the current you have to be Michael Phelps or you won't go anywhere," Korff said. People were skeptical at first of the swim portion being in the Hudson. But Korff explained, "We turned a negative into a positive and said this is the fastest swim in triathlon because you swim with the current." But to make sure racers are calm, the triathlon has a psychologist at the start of the swim to help if swimmers are jittery, he added. Charter yachts operators at the 79th Street Boat Basin said their biggest business tends to be from guys popping the question. "I should have my Screen Actors Guild card for the number of times I've had to act surprised," said Ed Bacon, who has been operating A Bacon Yacht Charter out of the boat basin for 25 years. He has done so with Regina Gordon, a chef trained at the Culinary Institute of America who whips up four-course dinners for guests (cost: 2 hours $795 and with champagne, shrimp cocktail and roses, $895). "She performs miracles in the little galley on the boat," Bacon said of Gordon. For a more DIY approach, Atlantic Yachting — which recently sailed a 43-foot boat up from the Virgin Islands for the upcoming season — has a BYOB policy for guests (cost: $490 for 2 hours). Like other charters, Atlantic also does a lot of engagements, birthdays and special occasions, but sometimes it's just six people who bring their own wine and beer and are looking for a better way to "pre-game" before a night on the town than sitting at home, Rowell said. "You bring your bottle of champagne and hand it to the crew, and we make sure you're served properly," Rowell said. "The crew makes sure you always have a beer in your hand or your champagne is topped up."